Each year, the Professional Association of Therapeutic Horsemanship International (PATH Intl.) 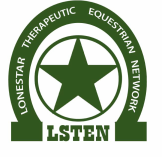 and the Lone Star Therapeutic Equestrian Network (LSTEN) host a Regional Conference that attract hundreds of attendees from the field of equine-assisted activities and therapies. This exciting and engaging conference are PATH Intl.’s premier educational events, where PATH Intl. members and other EAAT professionals gather to attend lectures by leading industry professionals, participate in hands-on workshops, learn about the latest developments in the field, and network with colleagues and peers. These conferences and meetings are not just educational opportunities, but also celebrations of innovation and accomplishment in EAAT, and PATH Intl.’s annual awards ceremony honors outstanding riders, equines, instructors and volunteers for their contributions to the industry. To promote and support interest in equine assisted activities for individuals with cognitive , physical, mental, and emotional differences by acting as a resource to all members and programs in the states of Texas, Arkansas, Louisiana, Oklahoma by hosting an annual conference for the region. All members to adhere to the industry standards of Professional Association of Therapeutic Horsemanship International (PATH Intl). The collection and documentation of data to record the effectiveness of equine-assisted activities for the disabled community. Collaborative efforts with university and medical research studies of the effectiveness of horseback riding and therapy for the disabled participants.